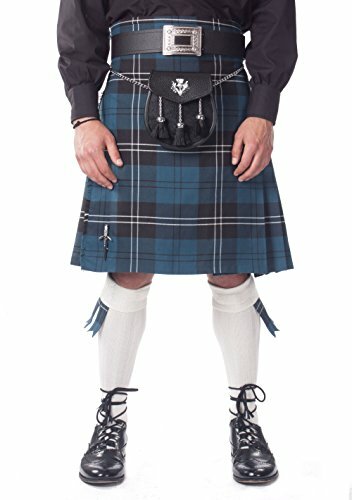 Kilt Society Mens 7 Piece Semi Dress Kilt Outfit- Ramsay Blue Tartan with White Hose 42" to 46"
This Ramsay Blue semi dress kilt outfit is a great starter set for those looking to build their first kilt outfit. This versatile outfit looks great when added to your existing wardrobe - try it out with a cool t-shirt or shirt for a unique look. The foundation of the outfit is a traditional style 8 yard kilt, made from woven tartan cloth and deeply pleated traditionally to sett. Ideal for casual wear or an alternative to hire, the kilt is finished with a 100% cotton waist lining, three leather straps for adjustable fastening and belt loops to allow for additional accessories which are included in this outfit. Our Kilt Society casual kilt outfit comes with a semi dress sporran with chain strap, standard leather kilt belt, Celtic knot buckle, chrome sword kilt pin, white hose, and matching Ramsay Blue flashes. Kilt Society Mens 7 Piece Semi Dress Kilt Outfit- Hamilton Tartan with Black Hose 38" to 42"
Kilt Society Mens 7 Piece Full Dress Kilt Outfit- Hamilton Tartan with Black Hose 42" to 46"
Kilt Society Mens 7 Piece Full Dress Kilt Outfit- Hamilton Tartan with White Hose 46" to 50"
Kilt Society Mens 7 Piece Semi Dress Kilt Outfit- Hamilton Tartan with White Hose 46" to 50"
Mens Heritage of Scotland Tartan 7 Piece Casual Kilt Outfit Size: 30" - 32"
Mens Mackenzie Modern Tartan 7 Piece Casual Kilt Outfit Size: 30" - 32"
Mens Scottish National Tartan 7 Piece Casual Kilt Outfit Size: 38" - 42"
Mens Scottish National Tartan 7 Piece Casual Kilt Outfit Size: 46" - 48"
Mens Royal Stewart Tartan 7 Piece Casual Kilt Outfit Size: 38" - 42"